This interview was previously published in Sculpture, 28(6), July/August 2009, pp. 46-7. Dreamscapes are often the subject of artworks, and Fergus Martin’s Pipe Dreams 2 takes dreams to a fundamentally visual level with a “floating raft of color in space.” But how was this visual solution achieved, and what decisions did Martin make when creating the work? Fergus Martin was born in Cork, Ireland, in 1955 and attended the Dun Laoghaire College of Art. After teaching English in Italy for nine years, he attended the New York Studio School. He has had solo shows at Green On Red Gallery and Oliver Dowling Gallery, among others, and his work is in the collection of the Irish Museum of Modern Art. He was awarded Pollock-Krasner Foundation Grants in 1999 and 2006. Pipe Dreams 2 was recently exhibited in the group show, “Yo, Mo’ Modernism (Part I),” at the Center for Contemporary Non- Objective Art (CCNOA) in Brussels, on the occasion of the First Brussels Biennial. Fergus Martin art: Pipe dreams 2 (2003). Plastic tubing and auto paint, each pipe, 98 x 7 cm. R.J. Preece: You refer to Pipe Dreams 2 as “a raft of floating color in space,” You also say that it is almost like a painting— could you explain? Fergus Martin: First, people should know that I started out as a painter, and I only brought sculpture into my practice about nine years ago. Right now, about one-third of my works are sculpture. I like the play between the two. For example, I’ve also been playing with horizontal shapes in my paintings. When you see Pipe Dreams 2 from a distance, the lime-green pipes merge and form a visual solid, a field of color, a play with optical illusion. It looks almost like a floating painting. R.J. Preece: So you are magnifying how an artwork changes based on the viewer’s vantage point and playing with color, shape, line, space, unity/variety, and contrast in the installation space. Plus, you’ve created a visually attractive focal point. The surface is very smooth. Why did you choose this finish? Fergus Martin: I love industrial materials. The plastic is very sensuous to me. I’m also working with unpainted stainless steel in other sculptures. R.J. Preece: The plastic tubing is visually a bit ambiguous. Fergus Martin: Yes, I like it when things in my work are ambiguous. 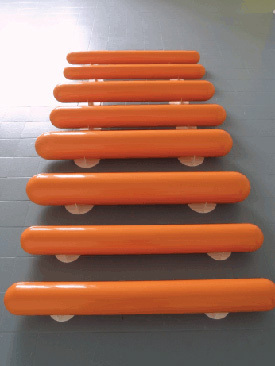 Here, the tubes are light, but when you look at them, the smooth surfaces suggest that they could be made from a heavier industrial material. I also like finding materials. I found these specific tubes and rounded caps, which are used in making models of oil refineries. I liked being true to them, and so the tubes and caps are the ready-made lengths. Fergus Martin. Pipe dreams 3 (2003). Plastic tubing and auto paint, each pipe, 98 cm long each. R.J. Preece: In the orange Pipe Dreams 3, you used tubing with different widths, but the widths are the same in the lime-green Pipe Dreams 2. Why this difference? Fergus Martin: It’s a subtle move in making variations across a series of work. I also do this with my paintings. It alters the visual effect. There’s a different visual rhythm, and I find it gives a new, playful quality. There are four Pipe Dreams. 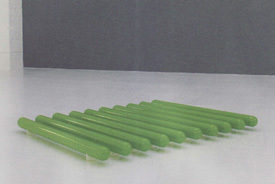 The other two have different colors, different numbers of tubes, and one has a different length. R.J. Preece: How did you decide on the color? Fergus Martin: I wanted a smooth, industrial-looking finish, and I had a car painter paint the sculptures. I chose the lime-green because I liked the coolness of the color. I chose the colors off a chart instinctually. R.J. Preece: How are you incorporating the title into the work? Fergus Martin: “Pipe dreams” refers to the pipes and also to unreal, fantastic, even illusory things, as well as hopes and plans. This made me think of dreaming and dreamers, and I found that right for this work. R.J. Preece: What are some of your influences? Fergus Martin: First, the industrial materials all around us— in the landscape and architecture, within a piece of furniture or a power tool, for example. Also, I like things that can be assembled and disassembled, like flat-pack furniture or even cars. In Pipe Dreams 2, the tubes simply rest on the white stands. Also, digital photography has affected how I see objects. R.J. Preece: Were you obsessed with Legos as a child? Fergus Martin: I loved Legos. My father was also obsessed with ship models. That’s never left me. In fact, when I was making Pipe Dreams 2, it reminded me of blowing up long balloons as a child. R.J. Preece: What do you want people to get out of the work? Fergus Martin: It’s funny you mentioned childhood. I’ve had some difficulty exhibiting the Pipe Dreams because children want to play with them. One adult burst out laughing when she saw them, which I thought was gorgeous. Another adult also said that she wanted to lie on them. I like it when the Pipe Dreams surprise people and generate an emotional reaction. In fact, I like it a lot. This text was part of RPProjects’ Visual. Textual. Visual in 2009. Click to read more about Visual. Textual. Visual.